San Diego Mayor Kevin L. Faulconer, San Diego Regional EDC, JPMorgan Chase & Co. and business and civic leaders, today unveiled the 15 companies selected to receive the MetroConnect Prize. . 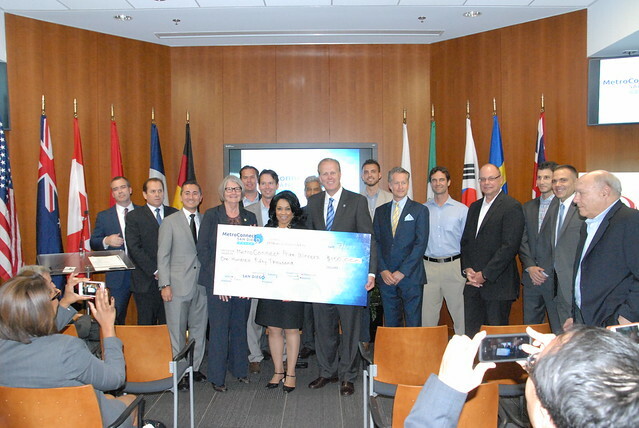 Managed by San Diego Regional EDC, and presented by JPMorgan Chase, the MetroConnect Prize grants 15 San Diego companies $10,000 each in order to assist with developing international business opportunities. The complete list of prize recipients can be found here. The MetroConnect Prize is made possible by JPMorgan Chase, a company committed to helping San Diego reach its full economic potential. With more than 85 percent of global growth through 2019 projected to occur outside of the U.S., global engagement is a big opportunity for many American cities, such as San Diego. According to the Brookings Institution, San Diego has the 17th largest economy in the U.S. in terms of GDP, but ranks 61st in terms of export intensity. In March 2015, Mayor Faulconer, San Diego Regional EDC and others launched the Go Global San Diego initiative, designed to help San Diego businesses attract foreign customers and investment and target key metro markets, including: London, Tokyo, Stockholm and other major global cities. The MetroConnect Prize was announced as a transactional way of helping companies reach more customers, thus translating into economic gain and job creation for the region. On the heels of national political gridlock around trade legislation, working with companies at a metropolitan level is essential if we want to grow jobs and our economy. MetroConnect Prize recipients will not only have access to funds, but also EDC and its affiliates’ international networks. In 2015 alone, EDC and many partners have traveled to London, Paris and Tokyo and will be heading to Brisbane and Sydney this week to further develop these networks critical to the success of local businesses. In total, 64 companies applied to receive the MetroConnect Prize. Companies were selected based on a variety of criteria, including interest in new markets, interest in targeted metro markets, assessed impact of funds, current international plan and more. A panel of judges, including representatives from Biocom, Connect, Qualcomm Ventures, Quantum Designs, San Diego Regional EDC, Software San Diego and Wireless Life Sciences Alliance, selected the winners. One company receiving the prize is EdgeWave, a San Diego-based company that employs 65 people. Currently, the cybersecurity company derives 10 percent of its revenue from foreign sources, and is looking to use the funds to further develop markets in Manila, Philippines and Shanghai, China. Companies can use the funds for a variety of global services including travel (to and from target market), participation in a trade show, establishment of a foreign subsidiary to operate in the market of interest, foreign language translation of marketing materials, export plan development and more. The funds are not expected to cover all of the expenses a company incurs in going global. Rather, the MetroConnect Prize was created by San Diego Regional EDC and JPMorgan Chase as a way to incentivize companies to kick start global efforts or explore a new foreign market. Thanks to Japan Airlines, companies looking to increase ties with the Japanese market have the added benefit of discounted flights to Narita International Airport in Tokyo. Currently, Tokyo is one of the two direct intercontinental flights from San Diego International Airport. Announced at the press conference today at the San Diego International Airport, MetroConnect Prize winners will also be eligible for the MetroConnect grand prize, an additional $50,000 to help one or two companies advance their global agendas. In late 2015, MetroConnect Prize recipients will be invited to share their stories for the judges, who will select the grand prize recipient(s).